Leopold Kiesling, Mars and Venus with Cupid, 1809. Leopold Kiesling (Schöneben, Upper Austria 1770–1827 Vienna) created the work while in Rome on an imperial scholarship. He spent several years there within the circle of Antonio Canova and Bertel Thorvaldsen; highly regarded by these exemplary artists, Kiesling in his day was considered Austria’s most important sculptor. The arrival of the statue in Vienna was well-timed as the marriage between Napoleon I and Marie Louise had just been negotiated by France and Austria. The alliance was meant to ensure the equalization of powers in Europe and put an end to military actions. 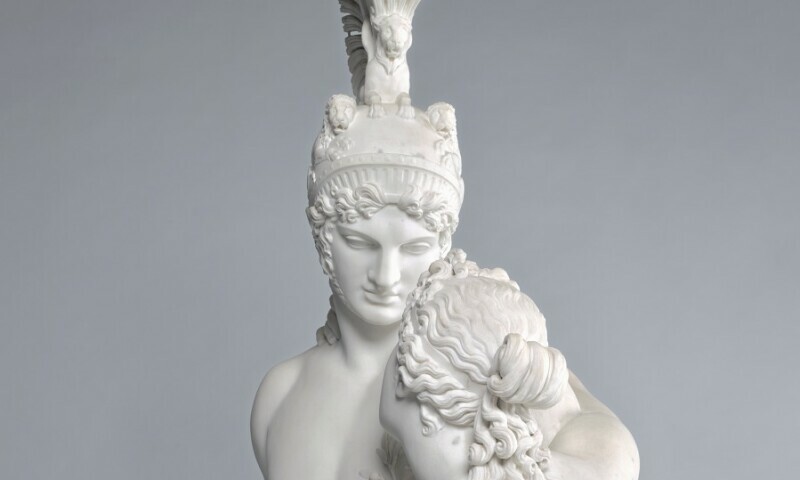 The Imperial House, therefore, saw the theme of the group sculpture as a gift: Venus, the goddess of love, tries to keep her lover, Mars, the god of war, from fighting any longer. Comparison with the mythological couple served to ennoble the dynastic decision at hand. Soon after arriving, the statue found its place in the Upper Belvedere. It was of particular importance during the Congress of Vienna – as congress participants and other noteworthy individuals walked the Imperial Picture Gallery, Kiesling’s Mars and Venus with Cupid served as a reminder of the theme’s significance to Europe.